How can I find an eye doctor near me? Our locator makes it easy to find an eye doctor in your local area. Simply tap the geolocation symbol next to the address field, and your current location will automatically appear. If you want to find an eye doctor in a different location, you may enter a street address or zip code manually. What information is provided about eye doctors near me? Our locator practice listings provide an address, phone number, and mapped driving directions. Some enhanced listings include lists of services, office hours, photos and more. How can I find an eye doctor near me who accepts my vision insurance? Many of the eye doctor listings in our locator have information about which insurance plans are accepted by the practice. To find an eye doctor who accepts payment from your plan, select your plan from the drop-down. Our locator lets you choose from over 60 insurance providers, such as VSP, EyeMed Vision Care, Blue Cross Blue Shield, and UnitedHealthcare. Can I schedule an eye exam near me? 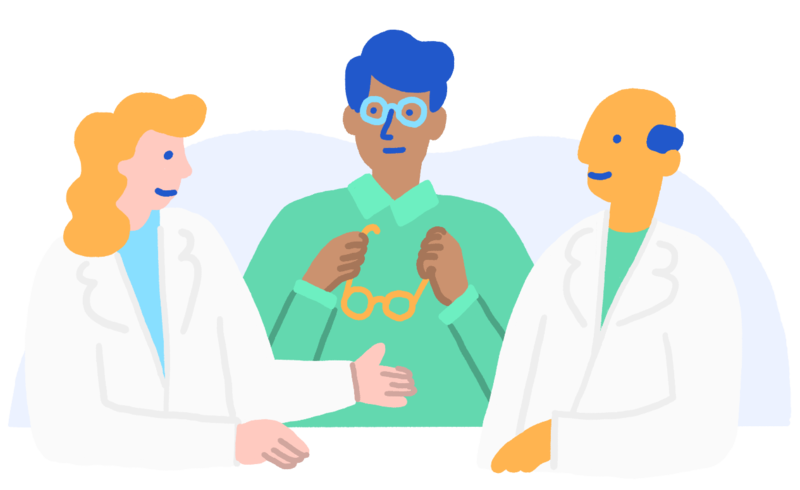 Some eye doctors provide the ability to begin the appointment scheduling process online, and some include a calendar of available dates. To contact other practices, a tap-to-call button is provided. Can I find a pediatric eye doctor and other eye specialists near me? Routine eye exams are essential for children in school because experts say more than 80 percent of information children receive in classrooms is presented visually. Children with risk factors for vision problems may need their first eye exam earlier than 6 months of age and may need more frequent eye exams throughout childhood. To find and contact practices offering pediatric eye exams, select “Pediatric Specialist” under “Specialities” in the filter menu. Other specialities for which you can filter for are: Cornea and Contact Lense Specialist, Glaucoma Specialist, Binocular Vision Specialist, Geriatric Specialist, Diabetic Specialist, and Dry Eye Specialist. Do I need a prescription to get eyeglasses or contact lenses? Yes. In the United States, you must get a vision prescription before purchasing eyewear. Most people get their vision prescription during an eye exam with an eye care professional. And often, people get more than one prescription at an eye exam – for eyeglasses, prescription sunglasses, computer glasses and contact lenses. Something you may not know? Eyeglasses and contact lens prescriptions are different. Does the locator include eyeglass stores near me? Yes. Our locator includes eye doctors (many of whom feature eyewear options in their offices), eyewear stores where you can purchase eyewear and websites where you can purchase eyewear online. It’s your choice where – and how – you want to purchase your glasses or contact lenses. Some people want an eye care professional’s guidance when selecting lenses, frames and checking the fit of contact lenses. Other people prefer to choose from a broad selection of frame styles in stores or research options online before selecting eyewear that can be tried on in your home or office. Should I see an optometrist, ophthalmologist, or optician for my eye exam? An optometrist (OD) is an eye doctor who performs comprehensive eye exams, prescribes eyeglasses and contact lenses for vision correction, and provides pre- and post-operative care for patients undergoing LASIK and other eye surgery performed by an ophthalmologist. Optometrists also are trained to diagnose and treat eye infections and other eye problems and diseases, including glaucoma. Some ODs also provide low vision services, vision therapy and other eye care services. An optometrist must complete a four-year doctorate program in optometry and many ODs complete a postgraduate residency with advanced study in a specific area of eye care. An ophthalmologist is a medical doctor (MD) or osteopathic doctor (DO) who specializes in eye and vision care. Ophthalmologists perform eye exams, diagnose and treat disease, prescribe medication and perform eye surgery. They also write prescriptions for eyeglasses and contact lenses. An ophthalmologist must complete four years of medical school, one year of internship, and at least three years of residency (hospital-based training) in the diagnosis and medical and surgical treatment of eye disorders. An optician is not an eye doctor and therefore cannot perform eye exams; diagnose or treat eye and vision problems; or write prescriptions for eyeglasses, contact lenses or medications. Opticians fit and sell eyeglasses that are prescribed by an optometrist or ophthalmologist; they also fit and sell sunglasses and other non-prescription eyewear. There is no education standard for opticians, but some states have training and licensure requirements for opticians; and in some states, opticians can become certified to fit contact lenses prescribed by an eye doctor. So how do I get started getting glasses or contacts? First, book an eye exam to get your vision tested. You’ll get a prescription if your vision needs to be corrected. Then, select and purchase your lenses, frames and/or contact lenses in your eye doctor’s office, at a store specializing in eyewear or an online retailer selling eyeglasses or contact lenses. Even if you don’t need glasses or contacts, your eye exam can turn up a host of health issues, such as diabetes and even cancer. 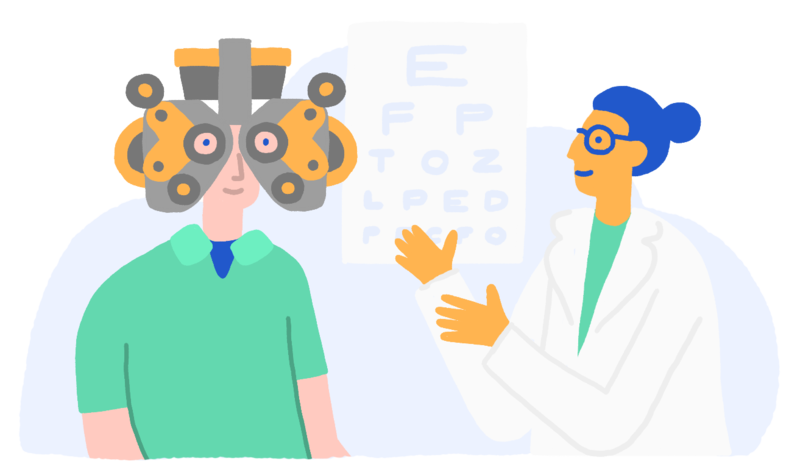 Seeing an eye doctor regularly, much as you see a medical doctor for an annual physical or have routine dental cleanings, should be part of your annual overall health checkup. If your eyes are healthy and don't require specialized medical or surgical treatment, the type of eye doctor you choose for a routine eye exam is a matter of personal preference. Still trying to find an eye care professional you trust? Choosing an eye care provider is an important health care decision. After all, you will be trusting your eye care specialist to safeguard your sight and help you maintain a lifetime of good vision. Still searching for an eye specialist? If you haven't found exactly what you want, try using our drop-downs and filters to find exactly what you're seeking. Or just call one of the nearby eye specialists and talk to a real person (during business hours, of course).